Slow cooking is a gentle method of releasing aromatic flavours from meat, fish, seafood and vegetables. Braising, a form of slow cooking, involves cooking meat on a bed of vegetables (a mirepoix) with a small amount of liquid in a covered pan, for a couple hours on a low heat. The vegetables are usually served with the meat and the wonderful cooking juices are used as a tasty sauce. Slow cooking can be perfect for delicious comfort food and Winter dishes, resulting in a steaming pot of tender meat and veg at the end of the day. 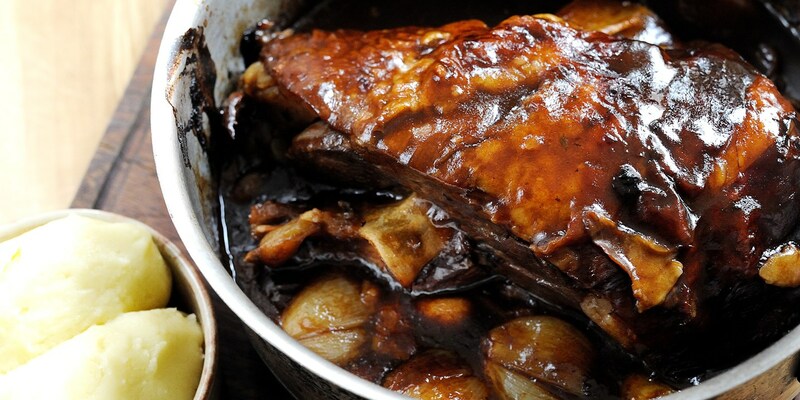 In this vein, Eric Chavot’s classic French daube de boeuf fits the bill, while Andy Waters braised red cabbage recipe is the ideal side to a Sunday roast or Christmas dinner. Not confined to the Winter months, this cooking method can be applied to fresher flavours, as Dominic Chapman does with his slow cooked duck leg with peas, lettuce, bacon and mint recipe.